Hey everyone! 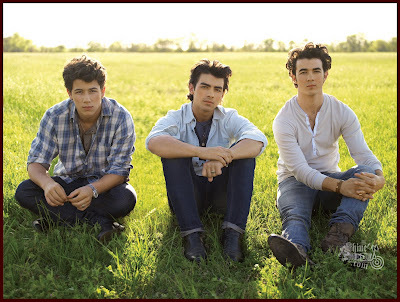 #1 – The Jonas Brothers are NOT breaking up! #4 - We are ALL excited about this project AND what we are doing TOGETHER! #5 – We plan to make music together for as long as we can. A news story hit the internet today concerning Nick Jonas & The Administration. We are so excited to share it with you…OUR FANS. About 6 months ago, the three of us had a 2 week break from touring, and we all decided to go and do something that was on our hearts. Joe went on a trip to Australia and New Zealand. Kevin spent some time with his fiancé Danielle. I decided to go to Nashville, TN to make a side project (Nick Jonas & The Administration) with 4 musicians - guys that I had met and worked with before. If I was to describe the sound to someone… I would say its “heart & soul”, because the music that I make is from my heart, and the lyrics I write are from my soul. We’ve said from the beginning of our career as the Jonas Brothers that anything we do outside of the group is a side project because you can’t break up brothers. My brothers are my biggest supporters, and were on the phone with me every day while I was in the studio asking how it was going, and telling me they couldn’t wait to hear the record. My brothers and I couldn’t be more excited to have these amazing opportunities as a group, and as individuals. We are already planning another world tour AS THE JONAS BROTHERS next summer, and it is all thanks to our amazing fans. I am so excited to share more details about my project with all of you as we come closer to the end of the year, but for right now, Kevin, Joe and I have a show to play in Venezuela! We are so proud of our brother Nick. We know that we will be doing music together for the rest of our lives. But we are thrilled for you to hear these songs that were on his heart. They are amazing works of art from an amazing talent…our brother. We will see you later this year, next year, and hopefully for the rest of our lives. “A three chord strand is not easily broken”, and one thing’s for sure… this three chord strand is stronger now than it’s ever been. You are truly the best fans in the world, and we love you with all our hearts.